No one ever really dies in comics — and now the "dead quarter," when comics sales traditionally go into hibernation, isn't dead any more, either. Retailers ordered at least a million more comic books in the first quarter of 2006 than in the first quarter of 2005, according to my analysis of the sales reports released by Diamond Comic Distributors on April 14. We're at $89 million overall for the first three months of 2006, up 9% from the first quarter of 2005. The chart analysis for March appears here. Marvel reached a notable threshold in March, placing 100 comics on Diamond's Top 300 list. That's a quantity we haven't seen in many years, although as the list includes reordered comics, many are appearing for the second time. The period of highest volume for Marvel offerings would have been in the early 1990s, when it often had more than 120 titles in the market. Comics unit sales: The Top 300 comic books had retailer orders of 6.99 million copies in March 2006, 4% more than March 2005, which also had five shipping weeks. 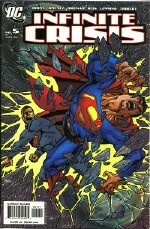 Retailers ordered 27,000 more comic books in March 2006. For the first quarter of 2006, the Top 300 comic books had orders of 18.61 million units, 6% more than 2005?s total of 17.56 million units. Infinite Crisis #5's sales of at least 201,800 copies led the field, representing significant growth from #4's January sales of 182,600 copies. In addition to the book's heat, the March issue also benefited from both the generally stronger retail conditions of March relative to January and from its placement in the calendar. Infinite Crisis #4 shipped on January 18, meaning the January chart captured only two weeks of reorders; #5 shipped on March 1, meaning a whole month's reorder activity appeared on the March charts. With #6 shipping April 5, the same phenomenon should recur in April's charts. The continuing phenomenon of ever more Marvel and DC issues in the Top 300 continues to push most new publishers off the Top 300 list. Exceptions were Tales of Alvin #1 from the Dabel Brothers, placing 282nd with 3,300 copies, and Full Cirkle #3, by the differently spelled Full Circle, which placed 286th with about 3,050 copies. A comic book now needs to sell more than 2,600 copies to make the Top 300 chart. That's a higher threshold than we've seen in a long time. By contrast, in the "bad old days" — going back to March 2001, near the beginning of the revival — you only needed to sell 800 copies to make the chart. You'd make the high 200s with 2,600 copies. That fact does not necessarily mean that independent titles are selling better, only that there are enough high-volume titles from the heavy hitters to soak up spaces on the chart smaller titles once took. Comics dollar sales: The Top 300 comic books had sales worth $21.51 million in March 2006, 11% more than March 2005's total of $19.06 million. For the first quarter of 2006, the Top 300 comics from each month have sold a combined $56.3 million, an increase of more than $6 million, or 13%, over the same period in the previous year. Trade paperbacks : The Top 100 trade paperbacks and graphic novels reported by Diamond had orders worth $4.05 million at full retail in March 2006, a drop of 5% from the total in March 2005. Adding those to the Top 300 comics for the month yields $25.56 million, an increase of 9% over March 2005's total of $23.35 million. For the first three months of 2006, the Top 300 comics and the Top 100 trade paperbacks from each month had orders worth $67.34 million, an increase of 11% over the same period in 2005. Exclusive: Diamond's overall sales: Diamond publishes dollar market shares for its top 20 publishers across all comics, trade paperbacks, and magazines. Knowing the exact total orders of any publisher on that list right down to the oldest backlist item allows you to calculate Diamond's total orders across these product groups. The March 2006 total was $34.8 million, which increases to $38.6 million, when Diamond's United Kingdom orders are added. The figure is 10% over March 2005?s U.S. total of $31.58 million. Overall, the first quarter stands at $89 million, 9% more than last year's total of $81.43 million. The "overall" category overstates comics' actual performance to the extent that magazines that do not have comics content are included. The comics publishers' market shares would actually be slightly higher, if ancillary items were removed. Market shares: Marvel again topped DC in Diamond's reported overall unit and dollar market shares. Marvel hit a historical mark of sorts by placing 100 titles in the Top 300; that figure includes many reordered comics making the list for a second time, but it recalls the days of the mid-1990s when Marvel last had 100 monthly titles. DC had 83 comics in the list — and Image's 40 is the highest that publisher has produced in some time. IDW actually took fourth in both units and dollars when only the Top 300 Comics are considered, owing to its slate of 15 comic books releasing in March versus Dark Horse's 10. Dark Horse's market share is nearly double that of IDW when trade paperbacks are added, however. Price analysis: The average comic book on Diamond's Top 300 list cost $3.15, up from $3.06 in March 2005. The weighted average price — that is, the cost of the average comic book Diamond sold — was $3.08, way up from $2.84 last year. The average price of the comics that made the Top 25 was $3.06, also up from $2.70 in March 2005. The comics being offered haven't gotten that much more expensive, but the comics people are buying the most have. Methodology: Diamond keys orders for all comics it lists sales for to Batman, with one "order index point" being equal to 1% of that title's orders. Using actual Diamond final orders from titles accounting for more than 25% of Diamond's Top 300, I determined that one point on Diamond?s order index was likely to equal 698 comic books — with a 95% probability that the real figure was between 697 and 699.